Like Grace I am always searching for projects to use up my stash of worsted weight wool. When I started knitting I stocked up on Patons and Cascade 220 like there was no tomorrow (plus I used them to knit just about everything) so I've amassed quite a stash of them. Now I've discovered many other yarns that I love, but I still turn to basic worsted wools for felting projects. 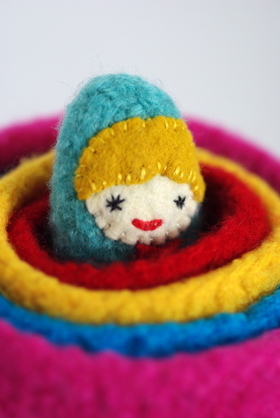 These dolls are super simple to make and the knitting portion of the pattern can be easily finished in one day. The finishing does take quite a bit longer, and some patience. 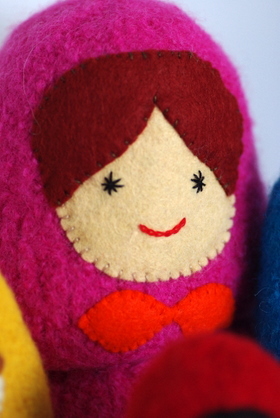 Katie's pattern gives good instructions on how to felt the doll pieces by hand and shape them after they are fulled. Although I love the look of the embroidered flower patches, my attempts looked pretty sad. This was not at all the pattern's fault. There were templates for each size and the directions were great, but I just couldn't stick it out. Instead I opted to add little bow ties from wool felt. I actually love them and the extra splash of color they add. 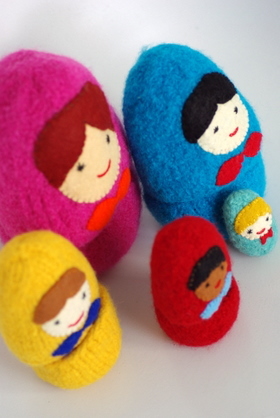 These little dolls are going to be a present for my niece Serena for her first birthday which is quickly approaching. I can't believe it's already been a year since she surprised us all by arriving over a month early. She's grown into such a wonderful healthy little girl. 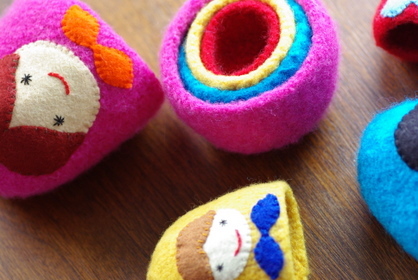 I hope she loves stacking and playing with these cute dolls!